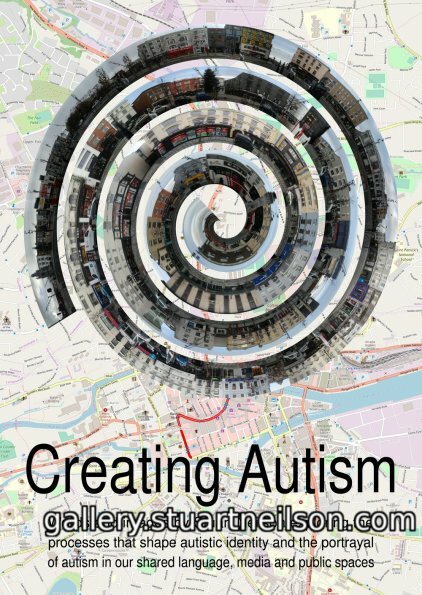 My exhibition “Creating Autism” is in St Peter’s Cork for most of February 2019, with a programme of associated events and talks. 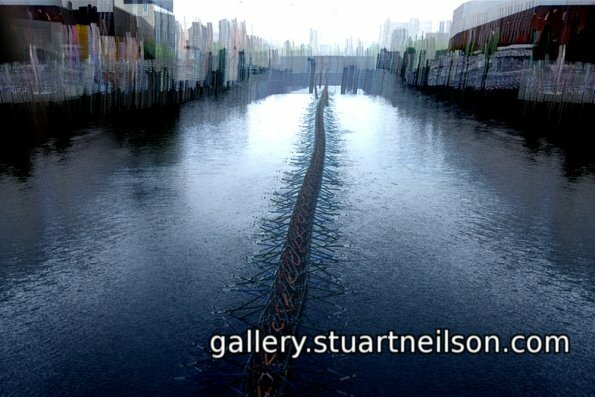 Please try to see the work as a whole in the gallery, and if you aren’t autistic, try to go with someone who is! My preview video, text brochure and other materials will give you an idea of what to expect. The exhibition puts forward the view that “autism” is a real, biological and neurological entity, but also an entire set of parallel meanings embedded in language and experience. 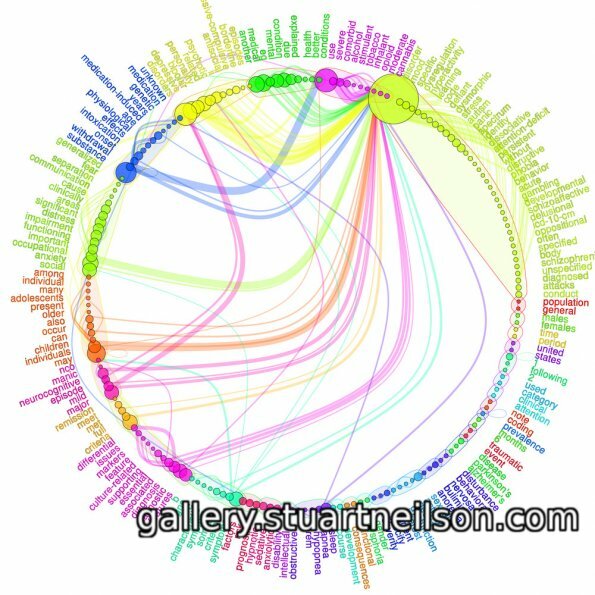 These alternative “autisms” overlap, portray autistic people in different ways in different times, places and contexts, and are frequently quite incompatible with one another. We have the opportunity to seize the metaphor and create the autism we want – a consensus that will suit us individually to different degrees. Some of the images use sampled video to create composite still images that explore my sensory experience of living in a city and sharing an environment that is often intense and alien, designed for a majority who either love sensory stimulation, or are simply not distracted and made anxious by sensory overload. This story will be in four parts: this History, Geography, Perspective and some Conclusions. One of the defining versions of “autism” is medical or psychiatric criteria for the diagnosis of autism. These have changed dramatically over the past seventy years. 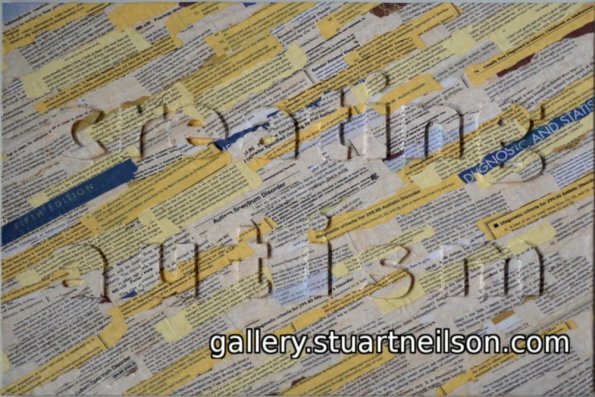 The title image is a plywood sheet with the words “creating autism” overlaid with printed text in layers. These are strips torn from pages of the Diagnostic and Statistical Manual of Mental Disorders containing the diagnostic criteria and descriptions of autism. The final layer of text in the collage is taken from autobiographies written by autistic people. (I am not a complete philistine, so these are colour photocopies and no books suffered in the making of this collage). The words used to define autism have changed over time. The most frequent words in the most widely used diagnostic criteria for autism (the DSM) described a schizophrenic reaction characterized by psychotic delusions and other disturbances (1952), whereas the latest edition describes a developmental disorder of social communication (2013). The ‘autism’ we have now} is not the same as the case histories described by Hans Asperger in 1938, or by Leo Kanner in 1943, or the medical criteria used to diagnose autism in 1952. Changing descriptions of autism} both reflect and shape the way we identify and perceive autistic people. 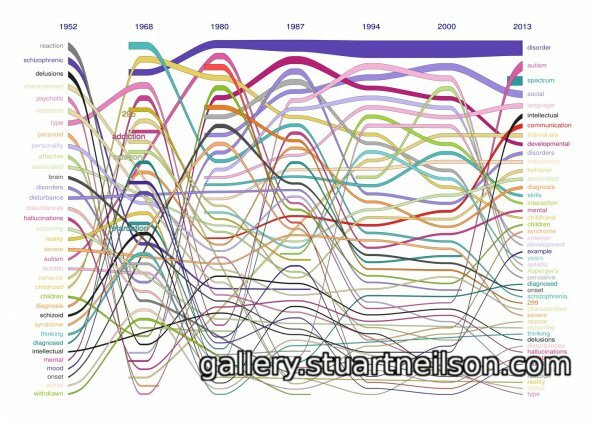 The alluvial plot is a modified form of the alluvial time-series plot in the statistical language R, generated from the frequency of the most common words in the full text of each edition of the DSM. The text includes the overview, diagnostic criteria and full description of autism, Asperger syndrome and autism spectrum disorder (or equivalent) in each edition. 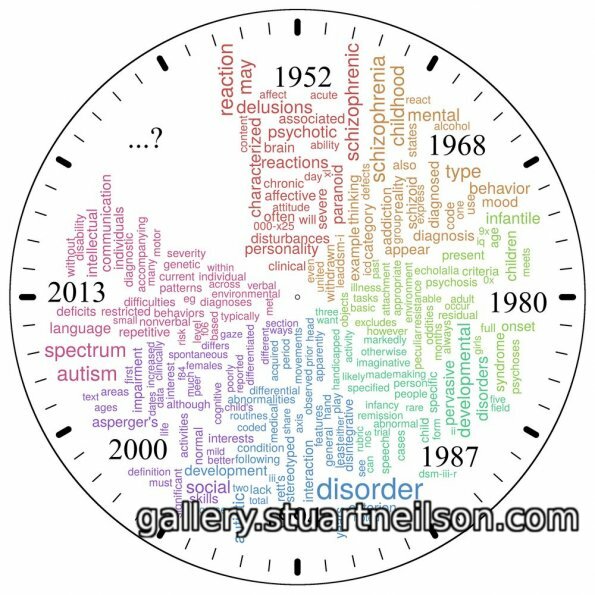 Autism O’Clock – word frequency in the definition of autism. Where next? The interconnection between conditions in the DSM – autism is within the large, yellow cluster to the top-right. These words, traits and inter-connections are at least in part a reflection of the cultural values of the eminent psychiatrists (picture them in your mind) who assembled the text. (K-means clustering). There are many kinds of ‘autism’. Autism is an aspect of human nature, a perception when (and if) we recognise the natural phenomenon, and the word(s) we choose to communicate that perception. The nature of autism may be unchanging, but we continuously create and re-create autism. We are far more likely to recognise and respond to autism as it is most often depicted by charities and media – a white, middle-class boy, and not a vocal, black woman. Starting line. 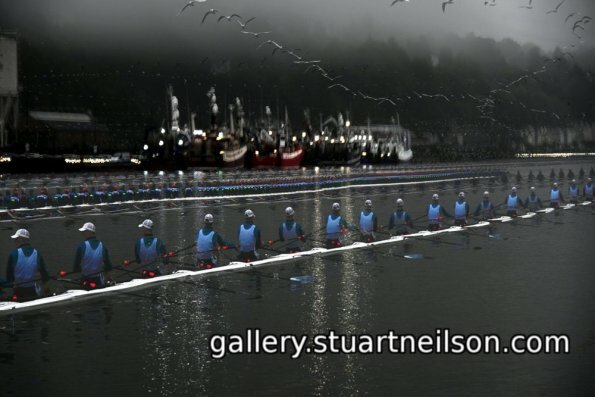 A competitor turns his head as he approaches the starting line at the Head of the River, with the drizzly mist, gulls and fishing boats at rest, whilst others race downstream towards the finish line at Blackrock Castle. I am fascinated by Desire Lines and the paths that people occupy in shared space, often far outside the architectural and functional lines that planners intended to bound activity. Who crosses within the lines of a crossing, or walks parallel to the edges of the paving? Desire Lines appear in grass, on Google Earth, in the snow and wear patterns in carpets or stone. Using video from a stationary camera, I calculate the areas of change between successive frames (or between individual frames and the background), to extract the pixels of objects in motion. There are some amazing operations you can perform on change pixels. Extracting the change pixels from equally spaced video frames and overlaying them (using, as above, a soft light overlay of the frame minimum and maximum) gives an effect like a strobe – in any lighting. Counting changes per pixel, i.e. the number of times a pixel differs between successive frames, measures the visual stimulus in a scene. Change can be colourised, to give a false-colour heat map of a place – a classroom, workplace or shop – to display ‘distraction’, or to show how people and crowds occupy space. Outlining change pixels (i.e. selecting all the pixels that change between frames and drawing an outline of the shape) shows whether objects overlap. These might be two students sharing contested desk space, or pedestrians on intersecting Desire Lines, or wild animals at a scarce water-hole. The coloured-in outlines of change look surprisingly like ancient cave paintings. Autism has probably always existed. Detailed historical cases include Victor, the Wild Boy of Aveyron, who was studied and described by the physician Jean Marc Gaspard Itard in 1801; Hugh Blair of Borgue who was dispossessed of his property in 1748 by his younger brother and legal guardian John; Michael Leahy who was drowned in the the River Flesk in 1825 during a ritual to “drive out the faeries” (a murder novelised by Hannah Kent in ‘The Good People’); and a number of the patients described in the chapter ‘The Insanity of Early Life’ by Henry Maudsley (in ‘The Pathology of the Mind’, 1879). 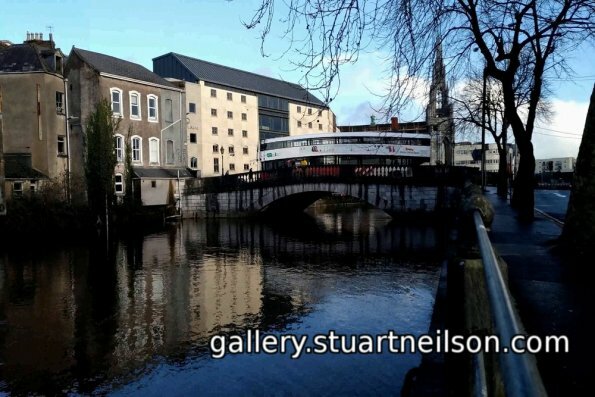 Currach in the Lee, with the wondeful repetition of the team’s oars as the pass under St Patrick’s Bridge downstream to Brian Boru Bridge. 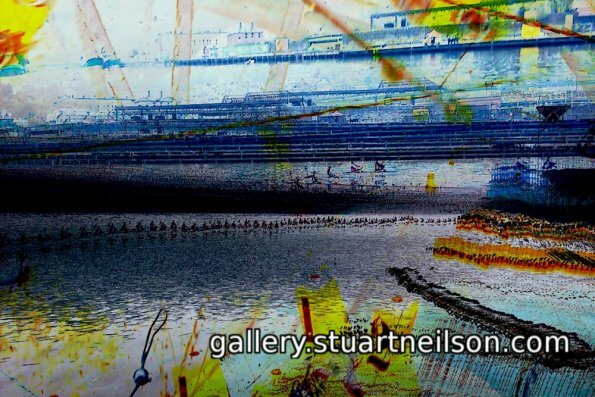 Head of the River, capturing a rowing team across the centre of the frame, the grand houses above Kent Station, the rusty shipping bollards and florescent safety signs – reminding me of the drizzle, the shouts of encouragement, the smell of diesel and seaweed under the docks and the shrieking gulls overhead. Fiction pre-dating the first medical description of autism} has portrayed many behaviours and characters who might now be perceived as ‘autistic’, including the Yahoos (who are treated as, and therefore behave as, beasts because they lack language), or the Laputans (who “are so taken up with intense speculations, that they neither can speak, nor attend to the discourses of others”), both in ‘Gulliver’s Travels’ by Jonathan Swift (1726); ‘Bartleby the Scrivener’ by Herman Melville (1853); or ‘Murphy’ by Samuel Beckett (1935). 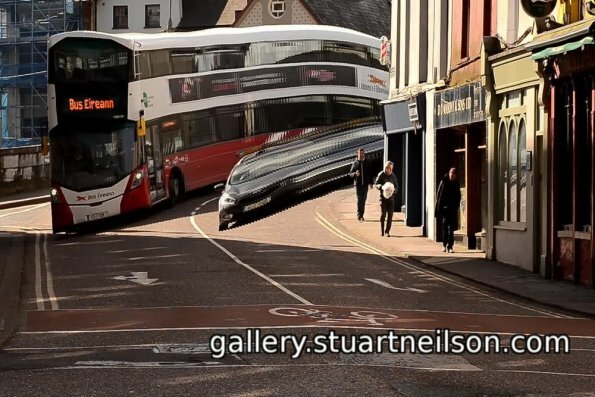 A bus drives over the arch on Parliament Bridge, from Sullivan’s Quay. Bus on Parliament Bridge, capturing for me the very bus-y-ness of the large vehicle snaking over the hump of the bridge and aroud the curve to South Mall, a huge City animal. The slit-scan camera, in its original form, moved a strip of film beneath a narrow vertical slit on which a moving image was focused. Anything moving past the camera leaves a trace, for instance verifying the athlete first to cross the finishing line or the intertwining of two dancers. The scans here use video (taken with a DSLR and a mobile phone), extracting and combining just the central vertical 1-pixel-wide column through the centre of each frame – imagine using a computer scanner outdoors as a camera. In a uniform image (e.g. “This is Me”), each pixel in the output is the centre of one frame of the parade as it passed by, with my camera stationary on Patrick Street. 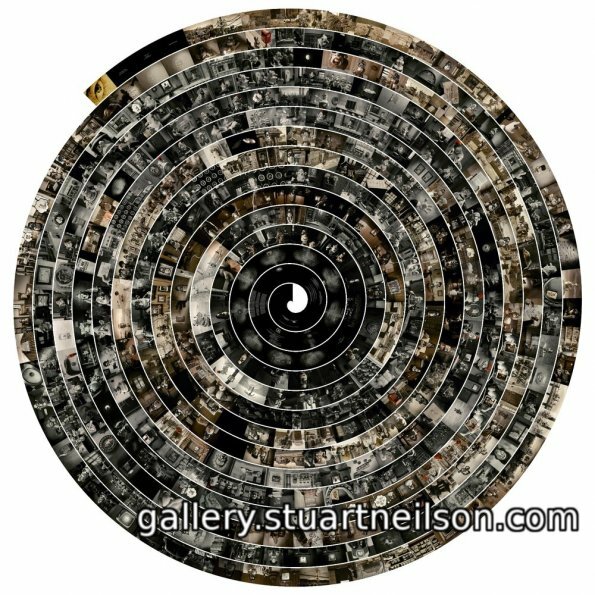 Some images play with ‘change’ or ‘stimulus’, instead of uniform time. A frame only contributes to the output scan if there is sufficient change between successive frames, or since the last frame that was selected. Passing a street facade in a moving vehicle, the shops only contribute to the image when when at least (say) 20% of pixels have changed. Sitting at the traffic lights does not contribute to the output, and driving slowly contributes less than driving fast. More playfully, ‘interesting’ features and frames with large visual stimulus (trees, or Gothic architecture) contribute more. An object is wider if it is visually stimulating and narrower if it is more bland and featureless. 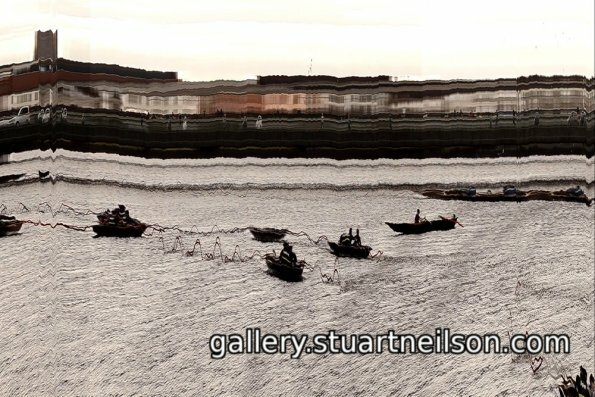 I use OpenCV (the Open Source Computer Vision Library) and Python to analyse moving video and generate simulated slit-camera and motion-mapping imagery and ImageMagick to process and combine images. Film has portrayed autism since the 1960s, evolving with medical and social understanding. The character Raymond Babbitt in the film ‘Rain Man’ (1988) has little in common with the autism portrayed by the character Billy Cranston in ‘Power Rangers’ (2017). Fictional portrayals of autism, like textbooks, teach parents, teachers and doctors about autism. Marvels Defenders, episode one, from opening credit to end credits. 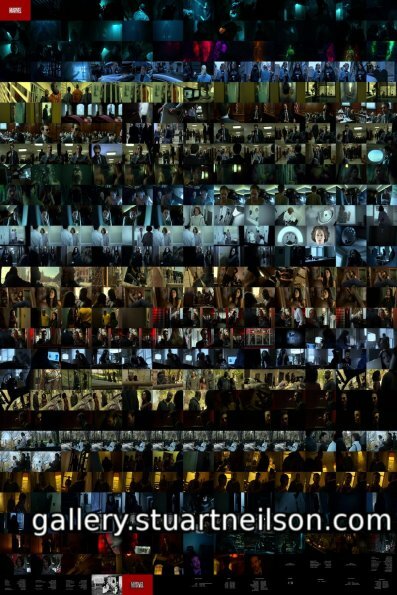 The scenes are coloured by character. Daredevil, for instance, is black with a red detail, Jessica Jones is night-blue, Luke Cage is fiery. The antagonist Alexandra is colourless, white. Mary & Max, from title to end credit (at the centre). Max is black & white (with a red detail), Mary is sepia. 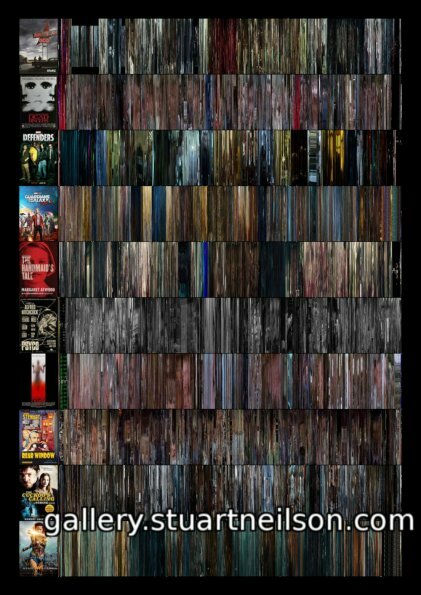 Film barcodes. A slit-scan delivers all 8 titles in the same width, rendering the average colour and brightness of the scene over time. Note how Gus van Sant’s 1998 ‘Psycho’ is a scene-for-scene replication of Alfred Hitchcock’s 1960 ‘Psycho’, the gendered colouring in ‘Wonder Woman’ (2017), and the “roller-coaster” action-intensity timings in ‘Guardians of the Galaxy’ (2008). 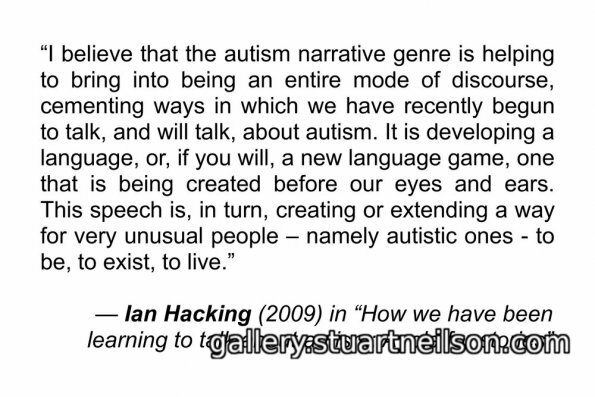 Autistic people also express their own identities, most explicitly on-line and in autobiographies. This relatively recent expression of ‘autism’ is often at odds with medical and interventionist language about autism as a disorder. Autistic people write about everyday life events, personal interests, food, travel and falling in love – just like other autobiographical writers.